Soft cotton-like fabric. Contoured waistband. Two oversized side pockets. Adidas 3-Stripes elastic waistband. Geo-deboss undershorts. Matte metallic adidas performance logo at lower left hem. 16.5" outseam. The Wilson Profile Junior package sets are sized for junior players of all physical statures. With clubs designed to get the ball airborne, these package sets will increase the confidence and level of a fun for a developing player. 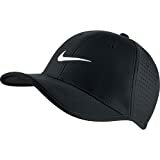 The Nike Junior Ultralight Perforated Cap is an ideal hat for any young athlete looking to sport a clean - classic look. This Ultralight Custom Cap is made using dri-fit fabric that wicks sweat away from the body to help keep you dry and comfortable. It features an interior taping for a classic look and an adjustable closure at the back for a snug, comfortable fit. 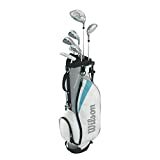 Tour Edge HT Max-D Junior Golf Set - Blue Age 9-12 HT Max-J junior sets and clubs for boys and girls offer high-flying technology that makes playing golf fun - and they're backed with the Tour Edge Lifetime Warranty! The best value in junior golf, HT JMax sets are available in three configurations and include a lightweight stand bag: Features: Tour Edge HT Max-D Junior Golf Set - Blue Age 9-12 ? 5x2 set for 9-12 year olds includes 2 woods, 4 irons and a putter ? Titanium matrix woods launch the ball higher and farther ? Hybrid design gives juniors cutting-edge game improvement technology ? Every wood, hybrid, iron and putter is available for individual purchase Specifications: Tour Edge HT Max-D Junior Golf Set CLUB LOFT LIE AGE 3-5 YRS LENGTH AGE 5-8 YRS LENGTH AGE 9-12 YRS LENGTH DRIVER 15° 56° N/A 36" 39" FAIRWAY 21° 57° 31" N/A 37" HYBRID 29° 60° N/A 31" 34" #7 IRON 37° 62° 27" 30" 33" #9 IRON 46° 63° N/A 29" 32" SAND WEDGE 53° 63° N/A N/A 31.5" PUTTER 3° 70° 24" 27" 30" Red set available in right and left hand. Pink set available in right hand only. N/A denotes "Not Available" in the set make-up for that age group. Ht max-j junior graphite shafts feature a low kick-point for higher launch Age / Height Recommendations: AGE HEIGHT 3-5yrs under 3'3" 5-8yrs 3'3" - 4'4" 9-12yrs 4'4" - 5'1"